Lima 2019 and Toyota Peru sign an agreement valued at almost US $2.5 million. Toyota will be the official car brand for the Lima 2019 Torch Relay that will travel the country for 23 days before the Opening Ceremony. LIMA, PERU (April 8, 2019) — A new Gold Sponsor joins the XVIII Pan American Games and Parapan Am Games of Lima 2019 as a strategic partner. Toyota signed the partnership today in Lima, Peru and will have exclusive sponsorship rights in the automobile category. The Special Project for the Preparation and Development of the XVIII Pan American Games and Parapan American Games Lima 2019 and the leader in the Japanese automobile industry signed a contract that guarantees the use of 15 hybrid technology vehicles including the Prius, RAV4 and a new Hatchback model that will soon be launched in the Peruvian market. These 15 vehicles will be at the disposal of Lima 2019 before and during the Pan Am Games, including the driver, fuel, insurance and parking needed to transport athletes and officials. In addition, the vehicles will be used throughout the Lima 2019 Torch Relay that will travel through 19 cities in Peru in 23 days. Toyota will also promote the Lima 2019 Pan Am Games through advertising campaigns in the media, as well as on its digital platforms and social networks. “Having a company with a track-record such as Toyota’s join the organization of the Games, demonstrates a valuable contribution and shows the commitment that we have all made to make this a world-class event. Here we say, ‘Let’s All Play’: from Government Officials to private companies, athletes and everyday citizens. We are happy to welcome Toyota as a new Sponsor in the Gold Category,” said Lima 2019 President, Carlos Neuhaus. “Toyota is proud to be one of the main sponsors of the most important multi-sport event ever held in Peru. 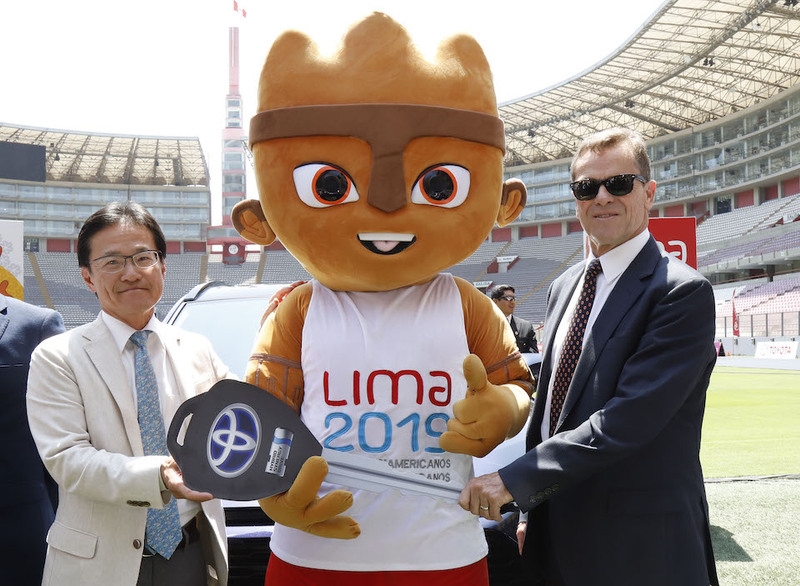 This agreement with Lima 2019 confirms the commitment of our company to the development of sport at the national and international level,” said Toyota Peru Executive President and CEO, Toshiro Hayashi. During the Lima 2019 Games, attendees at the National Sports Village (VIDENA) can also visit the Toyota House, a space that will feature special activities and where the latest technologies offered by the Toyota will be on display. Toyota recently sponsored the Buenos Aires 2018 Youth Olympic Games and is a sponsor of the Tokyo 2020 Olympic and Paralympic Games.